Whole Body Vibration (WBV) is fast becoming a phenomenon in the health and fitness world. It is a generic term used to describe any vibration of any frequency being transferred to the human body. Those who use WBV claim it offers a variety of health benefits which we explore below. Perhaps you have seen a large vibration platform in your local gym? These power plates are too expensive for home use, but fortunately, there are cheaper commercial options available. Keep reading to learn more about finding the best vibration platform. Sometimes called a vibration platform, vibration plate or power plate, it is a machine designed to provide your body’s muscles with a high-speed workout. It uses vibrations to stimulate the muscles and help them contract or relax. While they typically contract 1-2 times a second, a vibration machine causes 30-50 contractions a second. Proponents hail it as a fantastic time saver because it provides you with a practical training session and impacts a variety of muscles groups simultaneously. Hailed as ‘the microwave of fitness,’ 10 minutes on a vibration plate apparently equates to 60 minutes of strenuous exercise. Why Would I Need A Vibration Platform? In theory, you can continue to enjoy life and maintain a healthy weight through regular use of a vibration platform. Now that it is possible to buy one and exercise at home, you have no excuse not to feel those good, good, good vibrations! If you dread the thought of pounding the pavement, lifting heavy weights or exhausting yourself in a grueling spin class, a vibration machine could be the answer to your prayers. Regular use of a plate could result in increased muscle mass and bone density along with improved coordination and balance. Other possible benefits include weight loss, elevated metabolism, a reduction in cellulite and better blood circulation. Physical therapists now recommend vibration machine usage to patients in need of rehabilitation treatment because of the massage it provides. Cynics will tell you that in the health and fitness world if something is ‘too good to be true,’ it usually is! A vibration platform certainly falls into the ‘too good’ category as it promises to give you a full body workout without the need to overexert yourself in the gym. Surely, it can’t be effective? According to a study conducted by Artesis University College and the University of Antwerp (both institutions are in Belgium) in 2009, vibration machines work! The study clearly showed that obese females who used the plate and ate a healthy diet lost more fat in the long-term (including stubborn belly fat) than women who had a healthy diet and performed conventional exercise. If you’re interested, the group performed a variety of basic bodyweight exercises on the machines including lunges, squats, ab crunches, push-ups and calf raises. In total, they began with ten exercises at 30 seconds each and built up to 60 seconds over the course of 6 months. Although the conventional diet group lost 7% of the body weight during the period, the vibration plate group lost an average of 11%. Significantly, the women also maintained their new weight 6 months after the study ended. What Are The Best Vibration Plates? This vibration machine is one of Amazon’s best sellers, and is arguably the best ‘bang for your buck’ option on the market. Its power output is reasonable at 600W, and you can grab onto the handrails or tension cords to complete a full body workout safely. There is no shortage of options with the Confidence Fitness Slim plate as it offers 50-speed settings while its 1.5hp motor provides ample vibrations during exercise. You can check out relevant information such as pulse rate, BMI and the time elapsed as you train. A really interesting feature is the automatic shutdown which occurs after just 10 minutes. As well as preventing the motor from overheating, it stops you from taking things too far. One downside is the fact the Confidence doesn’t have and up and down motion which will limit exercise choice. Nonetheless, this sturdy vibration machine is small enough to fit into the home, doesn’t rock when you use it and allows you to check your progress as you train thanks to the easy to read display. Merax claims this vibration machine has a power output of 2000W and it is certainly an attractive looking piece of fitness equipment. It is a really good option if you’re into yoga and the adjustable speed settings allow you to control the intensity of your workout. As a result, it is a versatile machine that you can use for fat loss, muscle density increase or else you can place it on a low setting and enjoy a nice muscle relaxation session. Safety features include no-slip bottom grips and hand rails so it can be used by the whole family. There is a built-in computer to monitor the amount of calories you burn, and with 10 different preset programs, there is plenty of choice if you don’t feel like creating a tailor-made training program. It is competitively priced although we should point out that the Merax is a relatively large vibration plate. As a result, you’ll need to store it in the basement or make room for it elsewhere in the home. The Gadget Fit is one of the cheapest platforms on the list and the best model available for less than $200. It is designed for people interested in muscle tone so if you want to lose fat, look for a different option. It helps elongate and tighten muscles and is ideal for rehabilitation therapy. It features handles you can grab onto for safety while exercising and the computer display is easy to read. You can quickly change programs while exercising and the manufacturer claims the machine works up to 95% of your muscles in a single session. One of the best aspects of the Gadget Fit is its small size. You can install it in most homes or apartments, and its solid base means you can exercise as intensely as you like without worrying about falling over! Although it looks diminutive, don’t try and move it by yourself because it weighs 62 pounds! We were also impressed by the maximum user weight which is very reasonable at 265 pounds. It has an anti-static and anti-jamming mechanism, and with 50 incremental speed settings, you can challenge yourself or relax depending on your mood and fitness level. Although it only has three automatic built-in programs, you should use the Gadget Fit to create your own exercise masterpieces. Oscillating Plates: They typically lie at a pivotal point and operate in a similar manner to a see-saw. If you stand on an oscillating plate with your feet apart, one side rises while the other falls. This machine type causes your body to jiggle and is the most commonly used plate in the gym. They are easy to operate and can help you lose weight while also improving blood flow. Dual Vibration: These machines are relatively new and have a pair of independently controlled vibrating motions. They are the best vibration plate for pain management and bone density increase. Sonic: You will seldom see a sonic vibration plate in a commercial gym because they are difficult to operate. You can adjust amplitude and frequency, but incorrect use will lead to injury. Triplanar: These machines move much faster than their oscillating counterparts and are the plate of choice for professional athletes. While they are exceptional for improving strength and muscle tone, they are not the best vibration machine for weight loss. The type of machine you buy depends on how you want to use it. For example, do you want to perform push-ups and squats? If so, you need a plate capable of an up and down motion. Other routines involve a side to side motion. If you wish to complete a routine featuring both types of motion, don’t settle for a vibration platform that only allows you to do one. The most important thing to consider when using a vibration machine is stability. You’ll hold several positions during a workout routine, so the last thing you want is the contrast threat of falling off and causing injury! The plate should have an easy to read display that enables you to make adjustments even when the machine is operating at full capacity. The platform must be large enough to make mounting and dismounting an easy task. Given the cost of these platforms, it is reasonable to expect a few additional features. The best vibration machines include monitoring devices, exercise programs and advice for users with health issues. Any plate that helps you create a tailor-made regime is worth consideration. Some of the best vibration platforms cost thousands of dollars, yet the price isn’t always a guarantee of high quality. For instance, some of the more expensive models only allow you to perform up and down or side to side exercises; not both. Budget options often provide you with everything you need although they use lower power motors, so you receive fewer vibrations. Then again, powerful motors will cause your energy bill to increase! WBV is theoretically capable of recruiting up to 100% of your body’s muscle fibers compared to the 40-60% rate provided by resistance training. As a result, your body undergoes a vigorous examination while exercising on the plate to the point where a 10-minute session can provide you with the same results as one hour of intense exercise. However, experts suggest that 3-4 sessions of 15-30 minutes in duration a week is the best frequency. First and foremost, you can squeeze in a quick vibration training session in the morning before work because you can purchase one of these gadgets for the home. Manufacturers are creating increasingly more compact machines in various shapes and sizes, so they are easy to store when not in use. For best results, perform ‘dynamic’ exercises such as squats, triceps dips, lunges, and push-ups. When you exercise on a plate, the different levels of vibration sent to the body cause it to use muscle tissue to generate strength. Muscle growth is stimulated to meet these new demands, and the muscles become denser over a period. Vibration platforms are an effective form of rehabilitation treatment as they rebuild damaged tissue without exposing it to heavy weights. Regular use of a vibration machine helps increase bone mineral density. This can help prevent diseases such as osteoporosis. As you perform exercises on the plate, your hip flexors and core are engaged to keep the body stable. Over time, your balance, coordination, and flexibility improve. As is the case with all exercise, vibration training elevates your metabolism which leads to fat loss. Although vibration plates can help tackle osteoporosis, excessive vibrations may result in back trouble. As a result, we urge you not to overuse the machine and stick to the guidelines. Top of the range machines can cost several thousand dollars, and you may find that lower-priced options don’t perform the functions you would like. Most vibration plates are noisy when in use so your neighbors may not appreciate listening to the sounds in the early hours of the morning. They are heavy as well so moving them from place to place is a tough task. 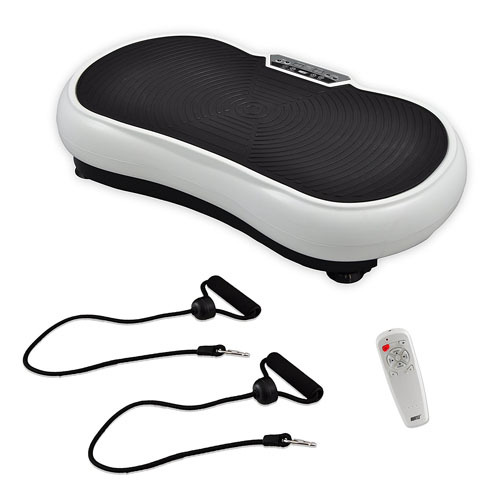 If you like the idea of losing fat, gaining muscle and strength, increasing bone density and improving your balance and coordination, consider purchasing a vibration platform for the home. It may cost you a reasonable amount of money, but the long-term benefits should outweigh the initial investment.